Using the API is an alternative way to configure and use your Mission Control account. This can be useful if you are interested in writing programs to explore and automate the use of our features. In this guide we will give you an example of using our API docs GUI. 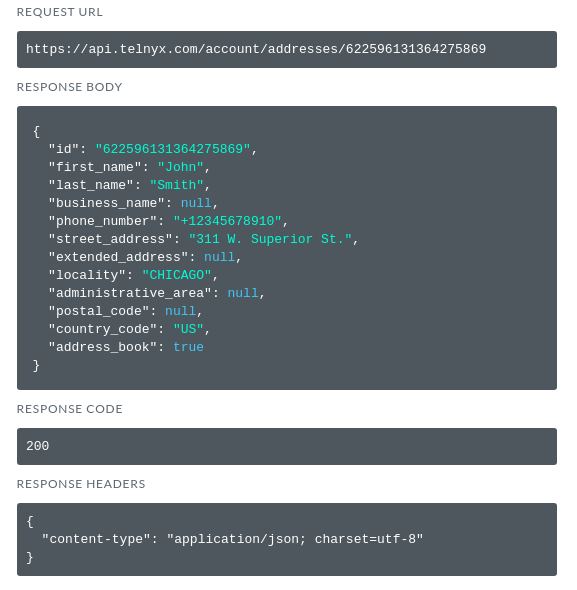 Hopefully this will give you a base for writing programs to interact with our API. Before we begin, we must tell the API our credentials so the API knows which portal account we will be using it with(and who we are). For how to do this, please refer to our article on "Authentication and Tokens" after updating your credentials you can follow on from here. 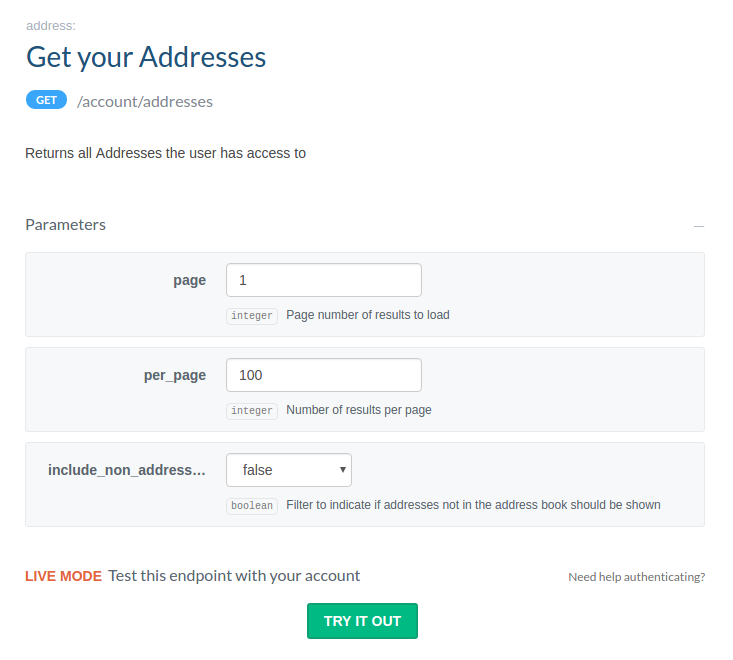 This endpoint GETs and returns addresses associated with your account. There are 3 parameters, simply fill these in with the amount of pages you would like returned, the amount of result per page & whether or not to include addresses not found in the address book. Once you've done that, hit "Try It Out". Congratulations! You got your Addresses! 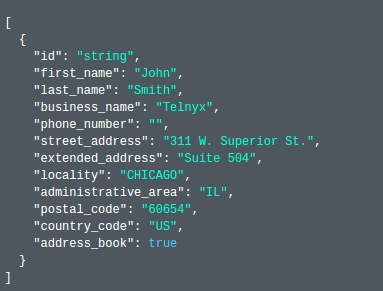 Take note of your address id, you'll need it for the rest of the address endpoints. Congratulations you have just added an address to your Telnyx account! 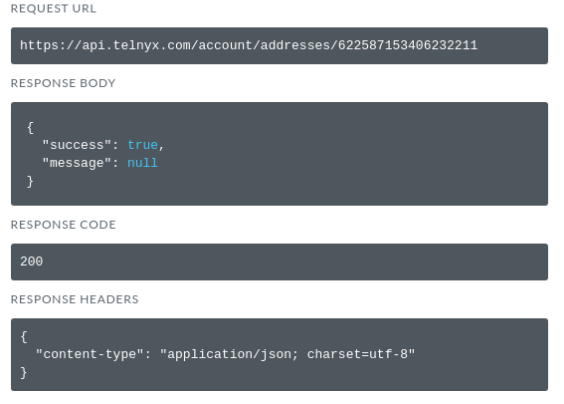 We can use the delete an address endpoint to delete an address from out Telnyx account. 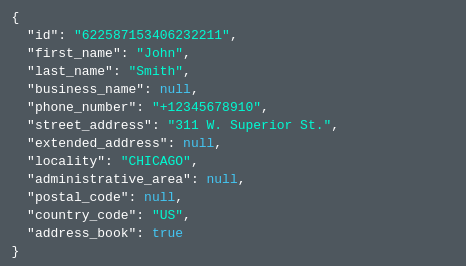 In order to delete the address, we will need to pass the address ID as a JSON argument. If you do not have your Address ID, you can acquire it by using the "Get your address" endpoint above. Once you have you ID, enter it into the "id" box and click "TRY IT NOW". You will get a response similar to the one below letting you know if you request was successful or not. We use the get an address endpoint to find out the details of an address given we have the address ID. Simply enter in the address ID into "id" parameter box and click "TRY IT OUT". The address information will be given to you in a response similar to the below. Congratulations! 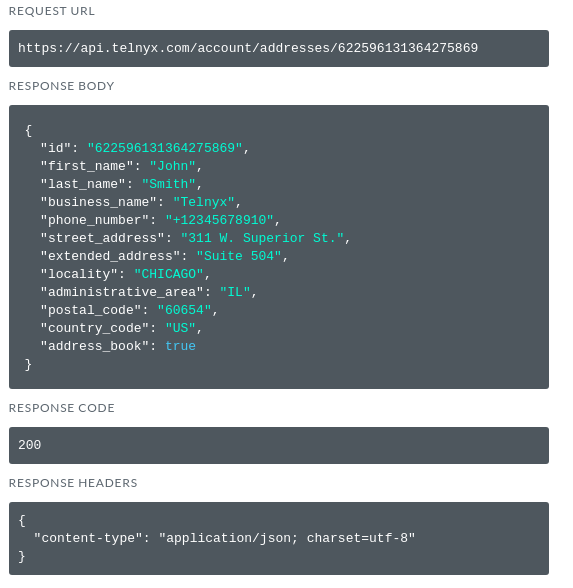 You are now able to manage your Addresses via the Mission Control API !